Chompzone | Tracking what we eat when we eat it. 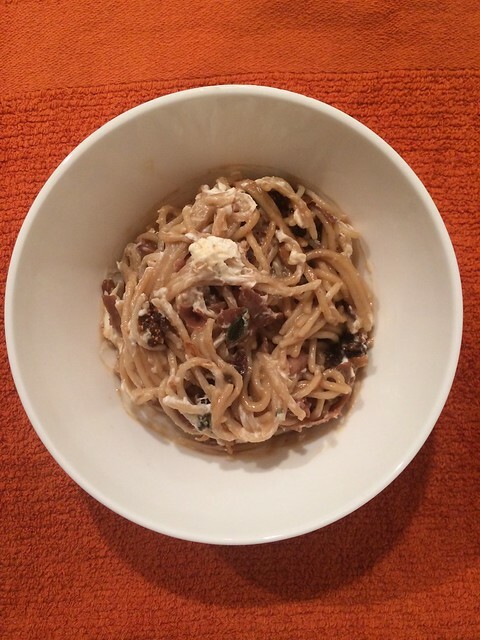 I had a goal of posting two new recipes on Chompzone a month. I succeeded in January, fell flat and February and now it’s almost the end of March! Yikes! But this one is a goody. A few weeks ago my dad took me to a Venezuelan restaurant in Philadelphia that is famous for its hot chocolate and being gluten free. The hot chocolate was amazing (you eat it with a spoon!) but it was the arepas that won me over. How have I never had an arepa?! I looked up where you can get them in Boston and it was Jamaica Plain or other parts of the city that I rarely frequent. And so I thought.. how hard can it really be to make these? So I decided to look up a few recipes and realized… this is really easy. And when I discovered we didn’t have cheddar cheese (which James and I are convinced we both bought last week… so its somewhere in our house! ), I thought I’d make use of the chicken leg and thighs that had been cooking in my crockpot all day. Thus, a recipe was born. Mix the corn flour and salt together in a large mixing bowl. Make a well in the center and add the warm water. Mix until everything is incorporated. Let rest for 5 minutes. Divide the dough into 8 even balls. Flatten to about 1/2-inch discs each. In a large frying pan (with lid), head 2 tbsp of oil on medium (if you’re using cast iron I am imagining you can get away with less oil). Add four of the corn patties and cover. Cook on medium heat for 6 -8 minutes. Remove cover, flip and cook uncovered for another 6 – 8 minutes. Remove and let cool on a wire rack (put paper towels underneath to catch oil drips). Add 2 more tbsp of oil and add the remaining patties. Cover and repeat the cooking process. Shred your meat and set aside. In a small frying pan, cook the onion on medium heat (use a small amount of oil or Pam to keep it from sticking), then add the zucchini. Add the red pepper flakes and cilantro (if using fresh, hold until the end). Add onions and zucchini to the chicken. Add the diced avocado and mayonnaise. Mix until combined. Squeeze the juice of half of a lime and mix to incorporate. Add fresh cilantro if using. Salt and pepper to your taste. 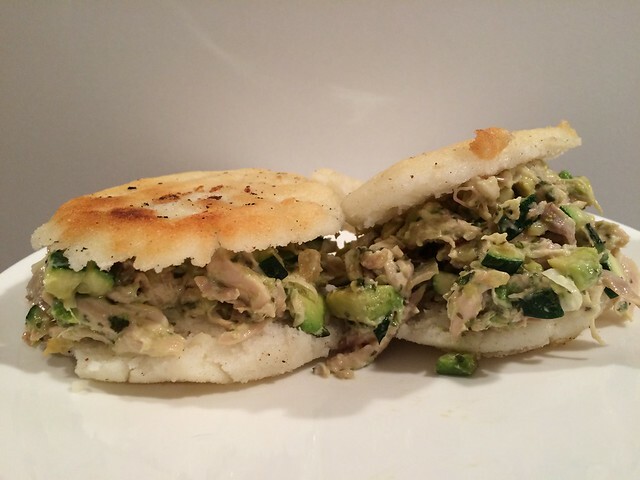 Cut the arepas in half (like a hamburger bun) and fill with chicken salad. Place top back on and enjoy! It snowed a lot. So much. It’s still snowing and we’ve already had more than 20 inches of snow. Everything is closed. Roads, grocery stores, the gym, my yoga studio… you name it. All of my protein is frozen and I didn’t feel like eating leftover beef stew again. 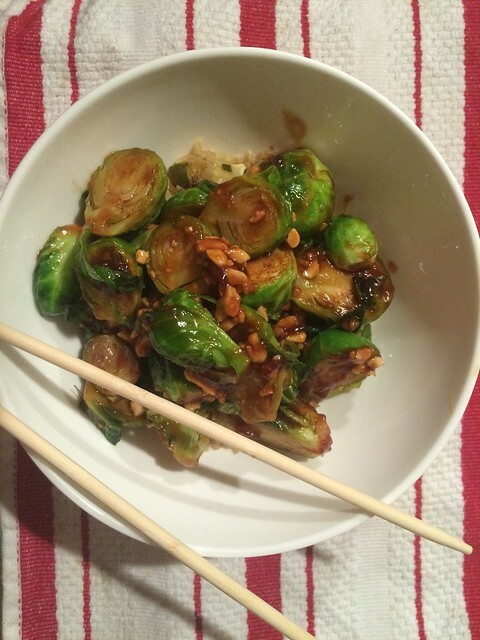 And then popped up a recipe from Bon Appetit for Kung Pao Brussels sprouts. I had, for once, a bag of Brussels sprouts in the fridge and a pot of already cooked rice in the fridge. It was perfect – except for one thing – the recipe was going to be WAY TOO HOT. So I modified it. Preheat the oven to 425 F. Cut the brussels sprouts in half and spread on a cookie sheet. Drizzle with 1 tbsp of the sesame oil. Sprinkle salt. Pop in the oven for 10 – 15 minutes, until starting to brown and slightly softened. While the sprouts are cooking, mix the cornstarch with 1 tbsp of water. In a small sauce pan, add the other tablespoon of sesame oil and heat on medium. Add the garlic and ginger. Cook for 1 – 2 minutes. Add the Sriracha and cook for another minute, stirring occasionally. Add the tamari, vinegar, sugar and 1/3 cup of water. Bring to a boil then reduce heat and add the corn starch slurry. Mix and cook for another minute until thickened. Remove from the heat. Remove the brussels sprouts from the oven and transfer to a bowl. Add the sauce and crushed peanuts. I’ve never cooked scallops before – though for much of my culinary “career” I was scallop adverse – having once ate them at approximately the same time I developed the flu. This is a very bad combination and one that will scar you for life. Flash forward to two years ago and I decided to give scallops a go again (in fact, on the evening that James proposed!). And then Puritan & Company opened, and I had more scallops. And more and more and more. Cured. Which brings me back to never cooking scallops before. I needed some help, and turned to Alton Brown for advice and support. Plus, any recipe with 150+ five star reviews (and nothing but!) is a sure thing. I had to make this my own though (of course!) and use up some ingredients in the fridge (like bacon and sage). 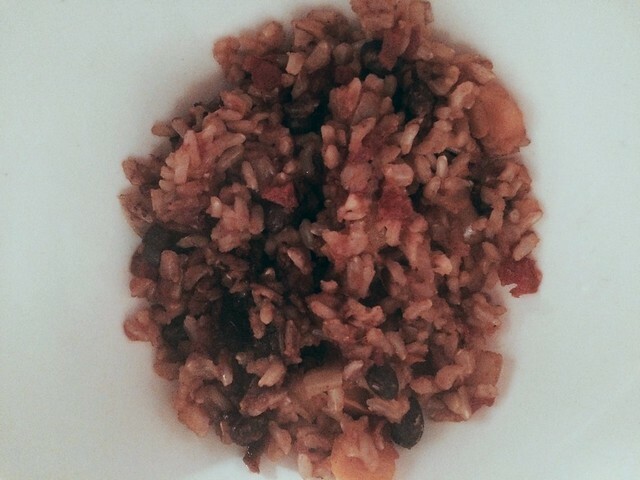 It was easy, delicious and considerably more affordable than anything I would get at a restaurant. This is a recipe that I recommend preparing all of your ingredients (as described above) in advance so that you can move quickly. In a large frying pan on high heat, add 1 tbsp of butter and 1 tbsp of olive oil. Add your trimmed and chopped asparagus. Cook for 3 – 4 minutes, stirring occasionally. Remove from heat. Rinse the scallops, remove the side muscle and pat dry. Lightly salt and pepper. Heat a large pan on high, add 1 tbsp of butter and melt. Once melted, add the chopped bacon and lower heat to medium. Cook until crispy (about 3 – 4 minutes), stirring occasionally. Remove bacon and let cool on a paper towel. Leave bacon fat in the pan. With the pan still on medium heat, add chopped sage to the bacon fat and cook for 1 minute. Stir occasionally. Add scallops. Ensure that the scallops do not touch. Cook for 1 1/2 – 2 minutes, then using a pair of tongs, flip over. Your scallops should have a nice crust/browning on the side that was heat down. Cook the scallops for another 1 1/2 – 2 minutes, then remove from the heat. 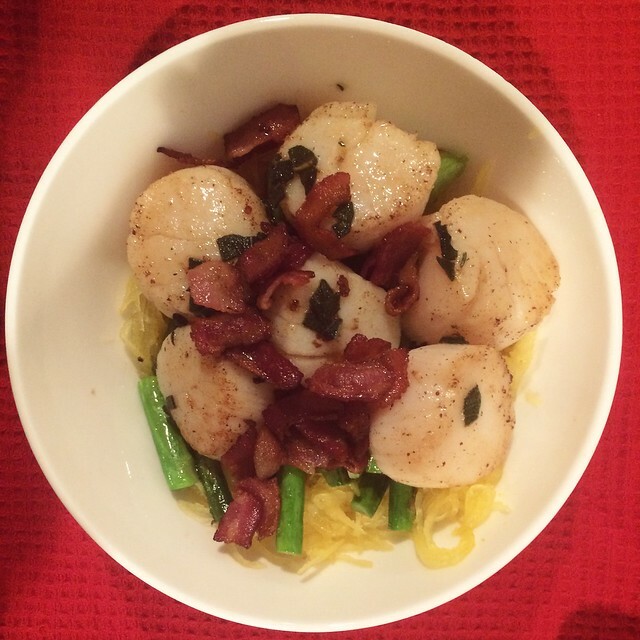 Serve scallops on top of spaghetti squash, pasta, risotto, etc. with asparagus. Spoon over some of the fat and sage in the pan. Sprinkle with cooked bacon bits. The majority of October I was out sick. This meant a lot of working from home with the Today Show on in the background. During the Kathy Lee and Hoda portion of the Today Show (which is usually on mute, because that is very painful to watch), I happened to catch a glimpse of a cooking segment featuring pumpkin chili. As a lover of all things pumpkin, this is not something one can forget so easily. 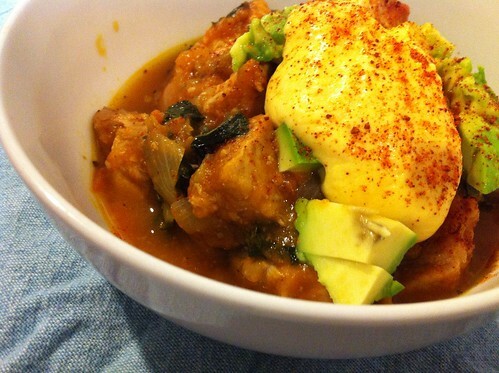 And so as I am finally back in action, three weeks later, I decided I must implement some sort of pumpkin stew recipe. And here my friends, you have it. This might be one of the best things I’ve ever made. Chop your pork into cubes. In a large pot, combine pork, beer, 3 cups of water, salt and half of the oregano (1 1/2 tsp). Bring to a simmer, removing some of the foam. Once a simmer has started, add in the two cans of chilis, lower the heat to medium and cover. Let simmer for 30 minutes. Add two tablespoons of the canned pumpkin to the 1/2 cup of sour cream. Mix together, cover and stick in the fridge. While your pork cubes are cooking, chop the onions and tomatoes. Heat the olive oil and add the onions and tomatoes. Lower the heat to medium and let cook for 15 minutes, until onions are translucent. Add the chili powder, the rest of the oregano and garlic. Cook another 5 minutes. Add the pumpkin and cook for another 5 minutes. Stir occasionally. Add the pumpkin and tomato mixture to the pork. Uncover and let simmer for 30 minutes, stirring occasionally. Add the kale, stir in and let cook for another 10 minutes. Let sit for 10 – 15 minutes before serving. 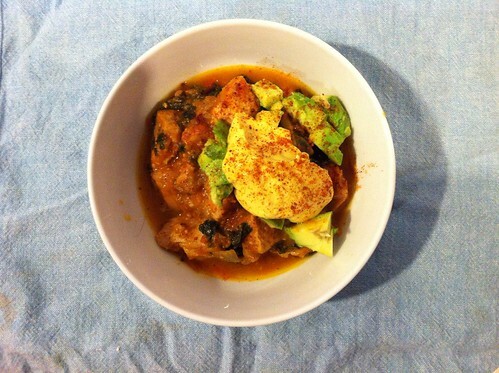 Ladle into bowls, add the pumpkin cream and sprinkle with salt and paprika or chili powder. 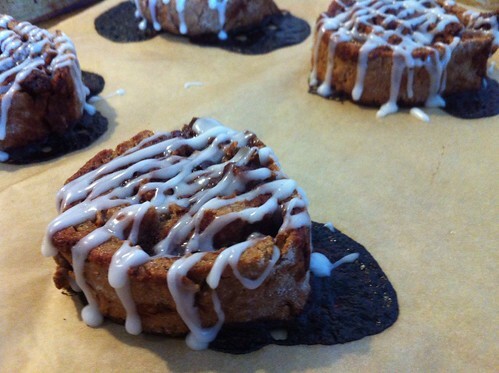 I don’t know about you, but I love cinnamon buns. It’s not something that one regularly gets to eat being gluten free, and unfortunately I have never found the perfect replacement. I made these paleo treats last year and while they were good (and I mean really good), they weren’t exactly what I was looking for. Then I decided this morning, because it was slightly cooler outside, and I woke up at 5:30 am (ugh), that I would give the cinnamon buns another whirl. I didn’t spend hours looking for the perfect recipe, I just grabbed my BabyCakes cookbook from the shelf and opened to the Wonder Buns recipe. I was skeptical. Only 20 minutes in the fridge? This is really going to roll up in a log and hold together? Let me tell you… it does and wow. This is exactly what I’ve been looking for! 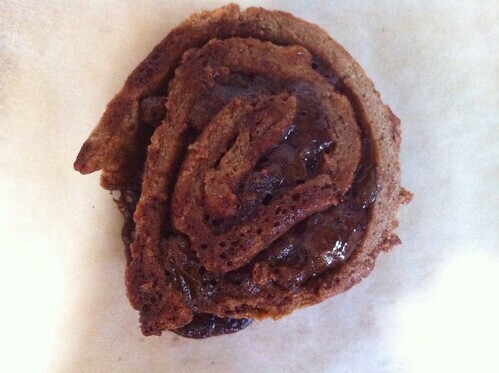 Combine the all purpose GF flour, brown rice flour, arrowroot, xantham gum, baking powder and cinnamon in a bowl. Add coconut oil, agave and vanilla. Stir with a rubber spatula until the dough resembles a course sticky crumble. Slowly add the warm water to the dough, stirring between intervals until you have a ball that is slightly sticky. I only ended up using a 1/2 cup. Cover the dough with plastic wrap and pop into the fridge for 20 minutes. Preheat your oven for 325 F. Line two baking sheets with parchment paper. Tear off a large piece of wax paper and sprinkle it with brown rice flour to prevent sticking. Remove the dough from the fridge and form a lumpy sort of rectangle and place on the wax paper. Sprinkle more brown rice flour on top and begin rolling it out into a rectangle that is 1/2″ thick. Brush half of the melted coconut oil onto the rolled out dough. Then combine the agave and cinnamon in a separate bowl (this takes a few minutes to come together). Spread on top of the dough, then sprinkle the raisins on top. Carefully, using the wax paper and a spatula to help you along the way, roll the dough from the short end until you have a 12″ log. With a sharp knife, cut roll in half and then each half into 6 equal pieces. 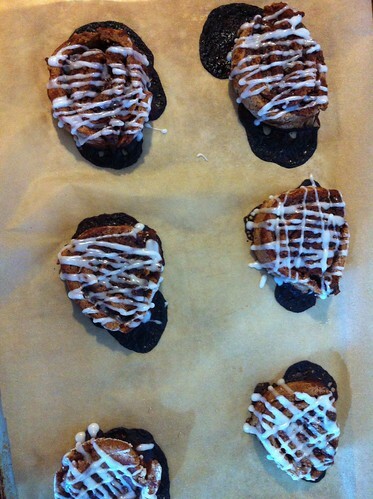 Place 6 buns on each baking sheet and put into the oven for 12 minutes. After the first round of cooking, remove and brush the remaining coconut oil on top of the buns. Put back in the oven for 4 – 5 minutes, but remember to reverse the pans. Remove and let sit for ten minutes. Then combine 1/2 cup of powdered sugar with 1 tbsp of vanilla almond milk. Drizzle on top of the buns. Inhale.